Due to the fact that two major youth international basketball tournaments, the World Student Games and EuroBasket Women are all on the international calendar this summer, the women's tournament for the 2013 Mediterranean Games is not taking place. France had agreed with the organisers of the Mediterranean Games to send a U19 team for the competition. But unfortunately not enough teams registered to take place, instead Jérôme Fournier has organised a training camp starting on 15 June 2013 in Vittel. However if France U19 had not committed to take part in the Mediterranean Games, they would have played in the 4-nation tournament in Fougères where they would have met Australia, Brazil and China. But it is the France U20 team who have entered this competition which has started on the 13 June 2013. The training camp will end with a three-game series against most likely the Belgium U20 team on the 21st, the 22nd and on the 23rd June. The matches will tip off at 18:00 CET. 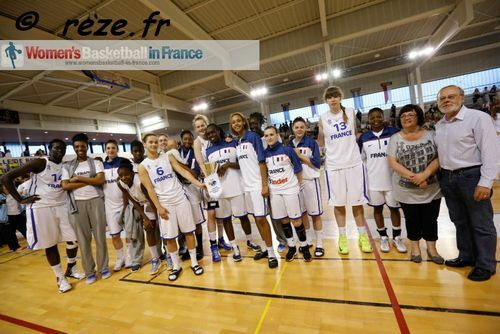 Fournier named the following 12 players for this camp: Marième Badiane (1994, Roche Vendée, LF2), Clarince Djaldi Tabdi (1995, CFBB, LF2), Olivia Epoupa (1994, Basket Landes, LFB), Elise Fagne (1994, CFBB, LF2), Aby Gaye (1995, CFBB, LF2), Pauline Lithard (1994, Reims BF, LF2), Eva Marsac (1994, Limoges ABC, LF2), Marie-Eve Paget (1994, Cavigal Nice, LF2), Eugénie Simonet-Keller (1995, Metz BC, NF3), Awa Sissoko (1994, Illkirch-Graffenstaden, LF2), Mamignan Toure (1994, Arras, LFB) and Lidija Turcinovic (1994, Lattes Montpellier, LFB). The preparation will continue with two further training camps and a two-match series against Canada before the final roster is finalised. The 2013 U19 FIBA World Championship for Women takes place in Lithuania from 18 until 28 July 2013. France have been drawn in Group C. In the preliminary round they meet Canada, the Netherlands and Senegal.